USA Hockey will host three disabled hockey events in Las Vegas for the first time this weekend. Headlining the trio of events is the 2018 USA Hockey Warrior Classic, presented by Terry Fator, which will take place Friday through Sunday (Oct. 5-7). Additionally, the 2018-19 U.S. National Sled Hockey Team will open its 2018-19 campaign with its first-ever training camp in Las Vegas in conjunction with the 2018 USA Hockey Disabled Hockey Workshop (Oct. 4-7). The USA Hockey Warrior Classic, presented by Terry Fator, is one of USA Hockey's newest disabled hockey events. Taking place for the third time, the event annually brings together teams from across the country competing in one of USA Hockey's fastest growing disabled hockey disciplines, Warrior Hockey. The discipline is dedicated to injured and disabled U.S. Military Veterans who have served our country and play the sport of ice hockey. Tournament play will include six games on Friday, four on Saturday and three games - including the two championship games - on Sunday. Fans can attend all games free of charge while live streaming by HockeyTV will be available at USAHockey.HockeyTV.com. 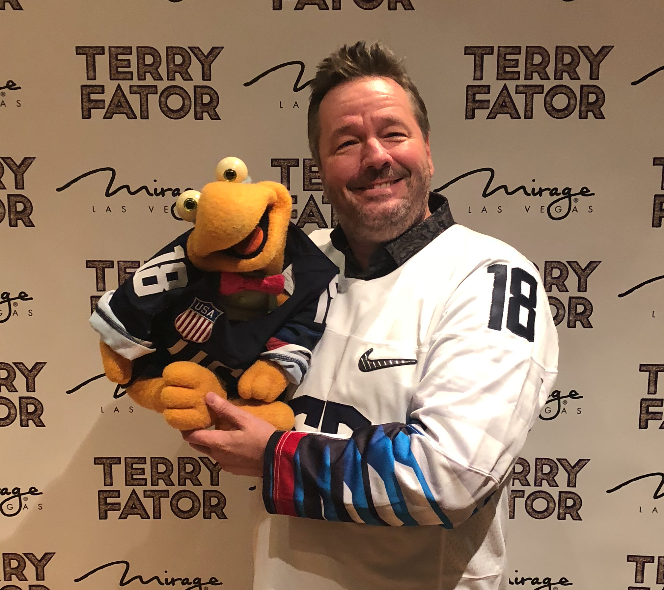 Comedian, singer and celebrity impressionist Terry Fator, a longtime supporter of various military charities, was named presenting sponsor of the USA Hockey Warrior Classic on July 16 and will take part in Friday night's opening ceremony at 8 p.m. PT. In addition to singing the National Anthem, Fator will take part in the ceremonial faceoff. Terry Fator became a household name in 2007 when he won Season 2 of “America’s Got Talent” with his unique brand of entertainment that combines singing, comedy, and unparalleled celebrity impressions. The No. 3 top-earning comic in 2015 behind Jerry Seinfeld and Kevin Hart, in 2017 Fator marked his 10th year since his “AGT” win by launching the Terry Fator Foundation which supports various military charities throughout the year. Additionally, the 2018-19 U.S. National Sled Hockey Team will hold five practices at City National Arena from Thursday (Oct. 4) through Saturday (Oct. 6). The team, which trains throughout the country in part to help grow awareness of the sport, is training in Las Vegas for the first time. Team USA's roster boasts 12 returnees from last year's gold medal-winning 2018 U.S. Paralympic Sled Hockey Team, including notable standouts in forwards Declan Farmer (Tampa, Fla.) and Brody Roybal (Northlake, Ill.); defensemen Josh Pauls (Green Brook, N.J.) and goaltender Steve Cash(Overland, Mo.). All practices are open to public. Also taking place in Las Vegas this weekend is the 2018 USA Hockey Disabled Hockey Workshop, where new and existing program administrators, board members, coaches and volunteers from around the country will come together for a weekend of educational sessions and networking. The workshop covers all six disabled hockey disciplines, including blind hockey, deaf/hard of hearing hockey, special hockey, sled hockey, standing/amputee and warrior hockey. Since 2012-13, USA Hockey's support of disabled hockey programs has resulted in a 70% increase in players and coaches participated in disabled hockey, including a 221% growth in warrior hockey and 114% increase in sled hockey. Last season, the 2018 Toyota-USA Hockey Disabled Hockey Festival, the largest hockey event of its kind, encompassed two weekends for the first time ever as an event-record 1,657 players and 124 teams took part. City National Arena | Las Vegas, Nev.
NOTES: The seven-team field this year is the largest in the brief history of the USA Hockey Warrior Classic. In each of the first two years, four teams participated ... Tournament play will include a round robin format followed by teams being divided into two playoff divisions ... The USA Hockey Warrior Classic was first played in the 2016-17 season. To be eligible to participate, all players must be or have been a veteran and member of the armed forces and meet a minimum disability rating ... A year ago, the Michigan Warriors defeated the Buffalo Warriors to earn the event championship in Fort Wayne, Ind., while the inaugural USA Hockey Warrior Classic was won by Buffalo, which edged Michigan in the title game in Washington, D.C. ... Labatt USA, Deloitte and Toyota are all sponsors of the U.S. National Sled Hockey Team ... The team will be led by head coach David Hoff (Bottineau, N.D.), who spent the last two seasons as an assistant coach for Team USA ... Since 2009, the U.S. has played in eight consecutive gold-medal games at the Paralympic and World Championship level, claiming three Paralympic gold medals (2010, 2014, 2018) and three world championship gold medals (2009, 2012, 2015) ... For more about disabled hockey, click here.